Look to the right and you’ll see loads of ways to keep up with strawberryplum. Like me on Facebook and I’ll let you know when I’ve got new posts up. Follow me on Instagram and see what I’m up to when I’m not in the kitchen along with some of the stuff that does’t make the blog. I’m still trying to wrap my head around exactly Twitter is all about, but if you tweet me, I’ll tweet back. You can comment or ask questions at the bottom of every post. Have you tried one of my recipes? I’d love to know how it turned out, good or bad. If you thought the instructions were hard to follow or a dish was an utter failure, let me know; I’ll rework things or help you troubleshoot. And if something was an epic success, that’s always nice to hear, too! And, of course, you could always send an email! It’s sarah.strawberryplum (at) gmail.com. Thanks for visiting. If you enjoyed your time on strawberryplum, pass it on to a friend. There’s plenty of room around my table! I love it! Beautiful photos, easy-to-follow recipes, fun wording – really gets me in the mood for fall cooking and great wine! Can’t wait to see more! How can we like you on Pinterest? I wish I knew! I’m trying to get up to speed with all things social media. I’m (gasp) finally setting up a facebook account and will let you all know when I’m pinning and tweeting and what-not. Thanks for following me so far! Thank you so much! I’m a little behind the times, technology-speaking, but I will get that plug-in up and running soon. Good luck with your blog! Loved all your good food ,the pictures are wonderful !Just like y0u, I am so very proud of you! Miss you. Love you very much, love, Grammy. Have fun with the ravioli–it’s always nice to have a helper, especially when it comes to rolling and filling ravioli! Sorry, I’m not. You can subscribe via email or rss. 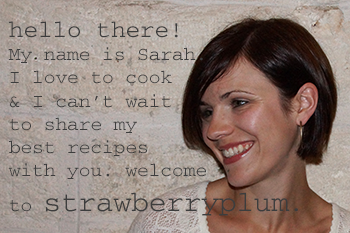 And if you like strawberryplum on Facebook, I’ll always let you know when there’s a new post up. I was planning on making the Pumpkin Gingerbread cake for Thanksgiving and wanted to know if you’ve frozen the cake layers. I thought I’d defrost the layers 2 days before Thanksgiving and keep it in the fridge after it’s frosted. I have made the pumpkin gingerbread as a loaf and frozen it for a few weeks–holds up fine! HOLY WOW!!!! I found your yummy food blog and decided to pluck a couple of recipes to add to my Pinterest account. However, after only a moment or two of browsing your site I realized I would be pinning all night because your recipes and site are AMAZING!!!! Every single dish looks better than the next. You are now officially my favorite blog! Thank you so much for sharing. Oh my goodness!!! Thank you so much for very flattering comment! I came across your blog when I was searching a recipe for an apple cake. I found many.I always say I take a longer tine choosing a cake recipe then bake one. But I chose your Apple Cake with sour cream and brown sugar crumble to try. Just so happened I was having some guests over. I have this habit of trying out new recipes for guests. And it was a hit! And have going over all your other recipes and I really fell in love with them all. Your cakes are just my kinda cakes too. I just wish I’m living where you are so that I can easily access the ingredients you use. By the way I’m from Malaysia. My goodness, Malayasia! It’s so exciting to see how far my little blog reaches. Thanks for reading! I’m glad you liked the apple cake…with all that crumb topping, it’s hard not to! Just wanted to say that having only recently come across your blog – I’ve ended up going all the way back to Day 1 and just really love it. I’ve only had the chance to try out a couple of recipes yet but they were both smashing. How nice to hear. Thanks, Jenny! I really like your style in cooking. Was looking for a mushroom soup and found your recipe. Trying it tonight! I’ll be back on your site for sure! I was looking for an apple cake recipe to make for my brother in law and his wife’s family as her mother just passed away! I am trying your apple cake with the crumb topping. It is in the oven now. I am super excited to give it to them as a sympathy gift! Thank you!